I’m creating videos for my ‘21 days of mindfulness’ and this makes me extremely aware of myself. Of the lines in my forehead, the red spot on my nose, the bags under my eyes, the weird facial expressions, the blank words I repeat… I could of course choose the perfect lightning so you can’t see the lines on my face. I could use a few layers of make-up, so you can’t see the red spot or the bags under my eyes. I could practice to keep my face straight during the whole video, so no weird facial expressions would show. And I could memorise exactly what I want to say, so I won’t use any fillers. But I’m not! Why should I hide all of these ‘imperfections’, while they are part of me? Why would I even call them ‘imperfections’? How can something natural be anything less than perfect…? Well… of course I know why or how, as we all want to look our best when we present ourselves to the outside world. We want to look beautiful, be considered ‘normal’ (instead of weird) and make a good impression. And this is what we not only see in the media these days, but also on many social media accounts. Perfect faces, perfect presentations, no mistakes. 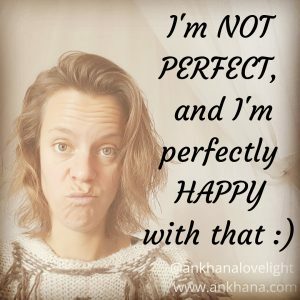 But I’m not perfect and I’m perfectly happy with that! I’m not like those girls or women who wear a lot of make-up, who are good in posing and who know exactly how to show themselves from their best side. I’m good in being me, just the way I am, with all that comes with it – you decide if you want to call it imperfections or not, I don’t mind. So I guess this is just a little warning in case you were thinking of joining the 21 days and you’re expecting to only see perfect videos of a perfect me – you won’t. I’m gonna show you myself the way I am and if that’s bothering you, don’t look! But if you like to see the real, pure me and also learn about being more aware, more present and more grateful in your day-to-day life – then I invite you to have a look! This entry was posted in Blog on 31 October 2018 by Ankhana.